Staff Selection Commission (SSC) CPO written test for various posts Inspector, Sub Inspector, and Assistant Sub Inspector has been conducted in the month of June. A large number of candidates interested in getting the central government jobs have competed for the CPO written test. The SSC has organized the written tests from 4th June to 10th June continuously. During these dates, the SSC has organized the CPO written test in many places across the nation. Hopefuls competed for SSC CPO Tier 1 examination in the month of June and waiting for the results can hold up for few more days to download the results. The organization is likely to announce the results soon on its official portal, ssc.nic.in. Competitors can download the result, check the cutoff marks, and merit list by signing up with the site. This article specially composed to give the aspirants more information about the SSC CPO Tier 1 result, cutoff marks, merit list. Staff Selection Commission (SSC) released the notification on 3rd March for 1223 Central Police Organization (CPO) Sub Inspector and Assistant Sub Inspector Vacancies. The application process was also started on the same date and continued till 2nd April. Many of the interested aspirants seeking for central government jobs have applied for the SSC CPO vacancies. The selection process of aspirants will be depending on various rounds such as Paper-I /Tier I, Physical Standard Test, Paper-II/ Tier II, and Document verification for merit list of candidates. Candidates clearing each phase will be sent to the next stage of the selection process. Finally, candidates clearing all rounds will be finally get selected for the announced posts. SSC has organized the CPO written test from 4th June to 10th June for all applicants. For qualified aspirants, the SSC is going to conduct the SSC CPO Tier II examination on 1st December 2018. Aspirants applied for the SSC CPO Tier 1 examination can shortly check their results on SSC official website, ssc.nic.in. Exam Conducting Body Staff Selection Commission. Post Name Inspector, Sub Inspector, and Assistant Sub Inspector. Examination Name SSC CPO Examination 2018. Notification Released Date 03 March 2018. Starting Date of Online Application 03 March 2018. Ending Date of Online Application 02 April 2018 (5:00 p.m). Online Paper-1 Exam Date 04th to 10th June 2018. Online Paper-2 Exam Date 01st December 2018. Job Category Police Government Jobs. Cutoff marks/qualifying marks are the marks specified by the SSC based on the level of competition, available posts, the difficulty level of the examination and other parameters. Competitors have to score the minimum cutoff marks to qualify the examination. The SSC CPO Tier I Cutoff marks 2018 will be announced shortly. Mostly, the organization will reveal the qualifying marks along with the results. Hopefuls can wait until the cutoff marks announced by SSC and after that, they can check whether they have qualified the test or not. For the reference of aspirants, here we have mentioned the SSC CPO Tier I Previous year cutoff marks. Competitors who have come across the CPO Tier 1 examination can expect the results in 1 st week of August (tentatively). Stay checking the SSC official website, ssc.nic.in for more updates. The organization will announce the exact result date soon on its official portal. Candidates who are going to check the results can follow the below given steps to download results. 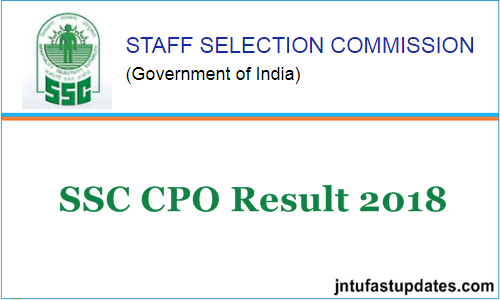 On the homepage, the ‘SSC CPO Tier 1 Result 2018’ Link will be displayed. Click on the link and enter the required details such as register number, password etc. Tap on the ‘Submit/Download’ button. The result will get downloaded. And also the SSC CPO Cutoff marks will be listed on the same page. Check the result and make sure qualified/not. Take a printout of the result for future usage.